Did you have a nice weekend? I did! Autumn is such a lovely time. The leaves have set the trees aglow, and even the ones on the ground are still festive shades of gold and plum and brown. I hope you also had a chance to get outside to enjoy the season wherever you are! This weekend I had the pleasure of working with Adorn cotton lawn by Allison Glass. I had chosen this fabric from the selections at Imagine Gnat for Rora. The fabric is so silky smooth! It's as luxurious as voile, but less slinky. 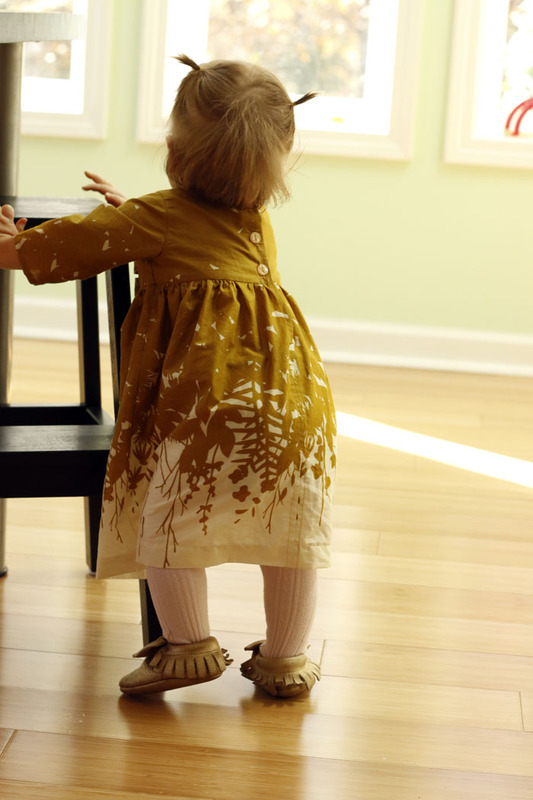 For practical reasons, I used the darker gold section of this print for her bodice and sleeves. Baby loves to feed herself, and we all know how that goes! This year her birthday is the day before Thanksgiving, so we'll celebrate with family on the holiday itself. She'll wear this dress at Thanksgiving and for her birthday pumpkin pie. Yikes! But then, what are clothes for if not to be worn, right? Even the handmade ones. 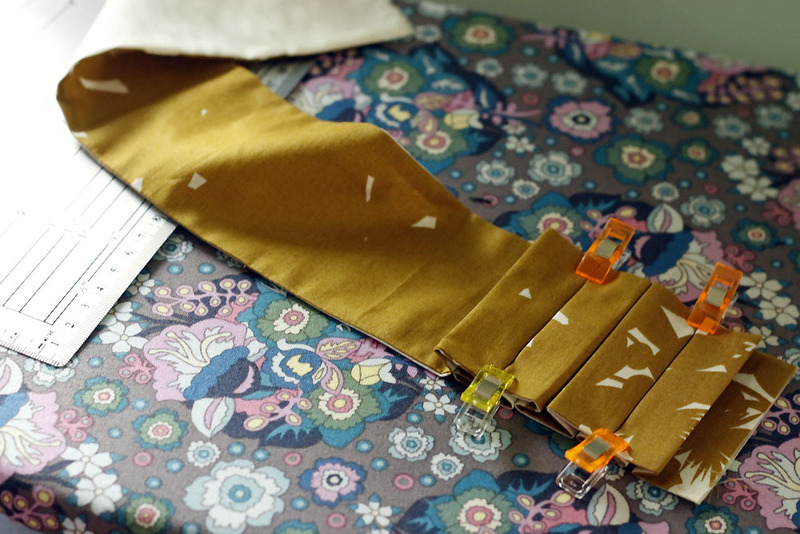 The bodice needed a little something, a subtle detail that would still feel fancy. I found this dress (source unknown), whose structured ruffle inspired my own. This tutorial provided the insight to bring it to life. Even if Brandon thinks it's odd, I like it. Without it I think the dress would have been too plainly constructed for the beauty of the fabric. Once I had completed the bodice and cut the skirt, I was so excited I had to share to Instagram! 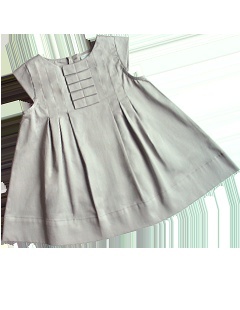 Today we'll just focus on the photos of the finished baby dress on Rora. She shows it off well! Oh, and don't miss these dainty peach buttons at the back. I just adore the way that shade mingles with the tawny gold lawn. Pure autumnal perfection! 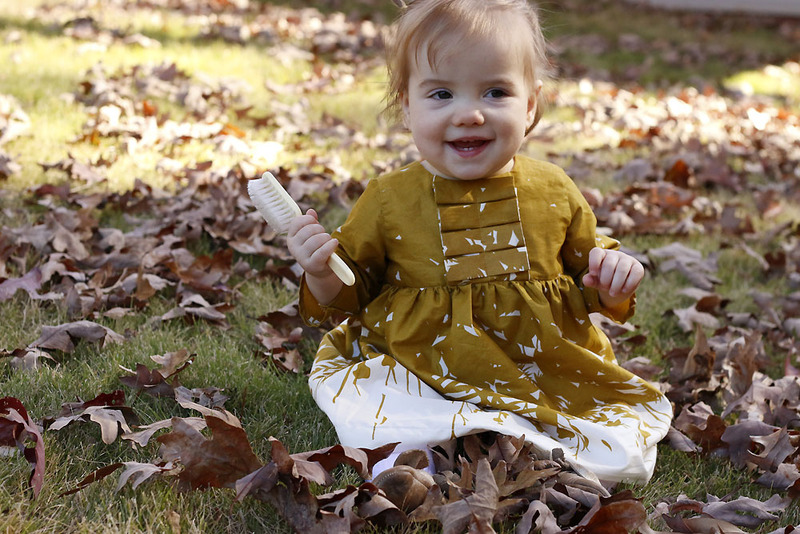 I love how a baby dress can be sewn in a day! I'm in a season of little projects now, after recently finishing two quilts. There are some gifts to be made and a Christmas dress for Rora. I asked Imagine Gnats to send some double gauze swatches to consider. 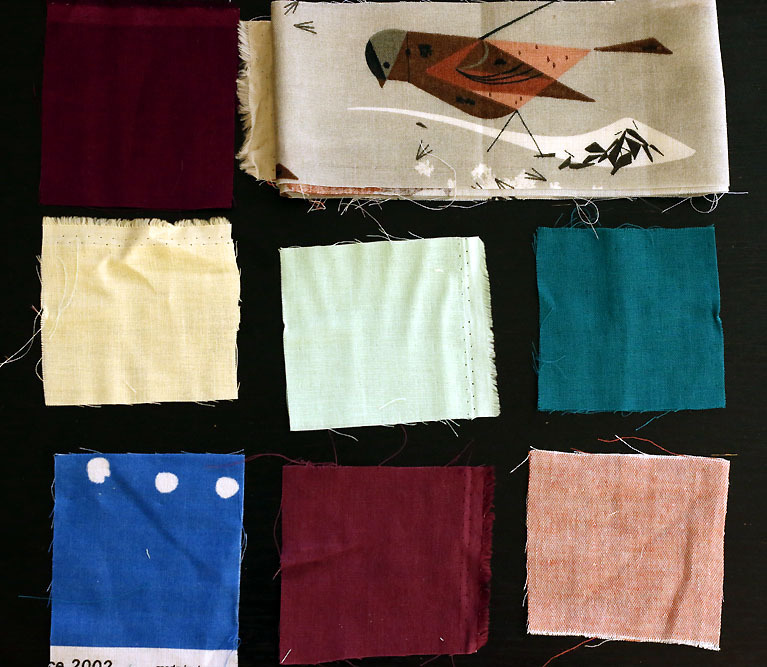 They are from top left: Wine, Charley Harper, Yellow, Mint, Teal, Nani Lapis, Plum and Heathered Red. Which one do you like for her Christmas dress? Choices, choices! Wishing us all much time to sew this week!